Time to talk about all of the new Echo devices, including the new Echo Clock! Amazon’s David Limp took to the stage at an Amazon event on Thursday saying that we had to get started because he had 70 pieces of news to share. I didn’t count them all but there were 11 new devices launched at the event starting with a new version of the Echo Dot and ending with the Echo auto for your car. 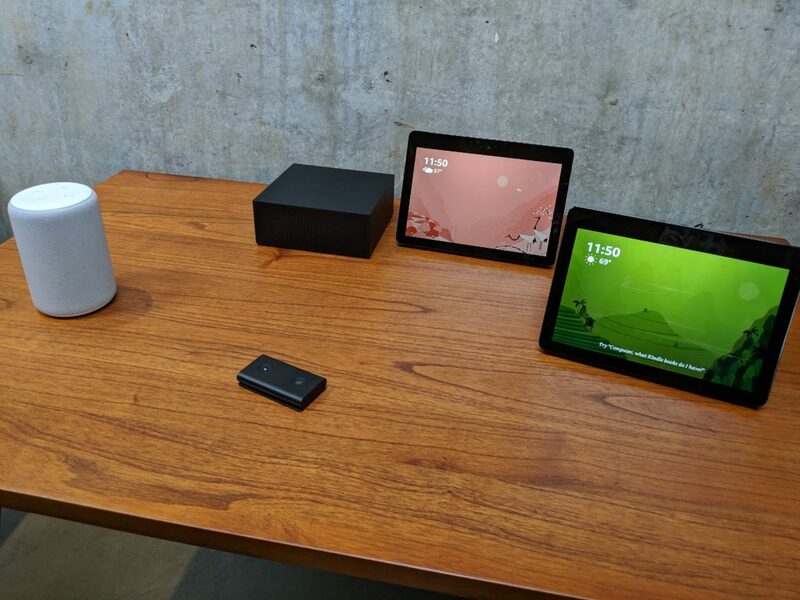 I’m going to focus on the devices here today and then in tomorrow’s newsletter do a deep dive into the Connect Kit ecosystem play that Amazon announced. That consists of a dev board and back-end services to make building connected devices easier. So let’s kick it with the devices and some quick thoughts on each of them. The Echo Dot: The new Echo Dot will cost $49.95. You can pre-order it now and it will be released Oct. 11. It looks like what might happen if your Apple HomePod and the Google Home Mini had a baby. I hate the fabric mesh design, but it’s apparently a thing, so I had better get used to it. This sounds better than the original Dot, but there’s not a whole lot here that is interesting. The Echo Input: For those of you who want to give your current powered speakers Alexa capabilities, the $34.99 Echo Input is for you. It will be available on its own and bundled with other speakers starting with some from Bose and Eufy. Also in related speaker news, Amazon is adding a software development kit for multi-room audio that other speaker makers can use in their devices. Get ready for companies making AV equipment to start integrating SDKs left and right from Google, Apple, Sonos, Amazon and maybe more. As a consumer, get ready for constant updates and a user experience that could degrade over time. A new Echo Plus: Amazon is adding a temperature sensor to its smart home hub device. While not everyone thinks an Amazon Echo with a ZigBee radio qualifies as a smart home (there’s no Z-wave radio), Amazon is proud of the new Echo Plus. The device has an upgraded speaker and will cost $149.99. You can pre-order it now and it will be released Oct. 11. The Echo Sub: The Amazon Alexa subwoofer is here and it will cost $129.99. I don’t have anything to say about this. It sounds like a lot of bass. You can pre-order it now and it will be released Oct. 11. A new Echo Show: Ooooh pretty. The new show eliminates that ugly speaker underneath the screen and places the speakers in the back of the device. Now it’s all screen and it sounds much better. The cost is the same as the original Show at $229.99 and it is available today. Related to this device, Amazon has created a way to integrate with other voice communications providers and will start with Skype. This means you can now conduct Skype calls on your Echo device in addition to the Drop In and voice calls. You can pre-order it now and it will be released Oct. 11. The new Amazon Echo Plus, the Echo Auto and the new Echo Show. Echo Auto: This tiny device puts the Amazon Echo in your car and uses the location from your phone??? to offer directions, trigger events as you get near your home and even suggest nearby restaurants. It will only be available with an invite at first and those getting an invite can expect to pay $24.99. Those getting it later will pay $49.99. Of all the devices I saw this is the one I’d buy now if I could. The Echo Link and the Echo Link Amp: For those of you with existing in-ceiling speakers or an existing AV set up, Amazon is announcing the Link and Link Amp so you can hear Alexa over those speakers. It will cost $199.99 for the Link and $299.99 for the Link Amp. 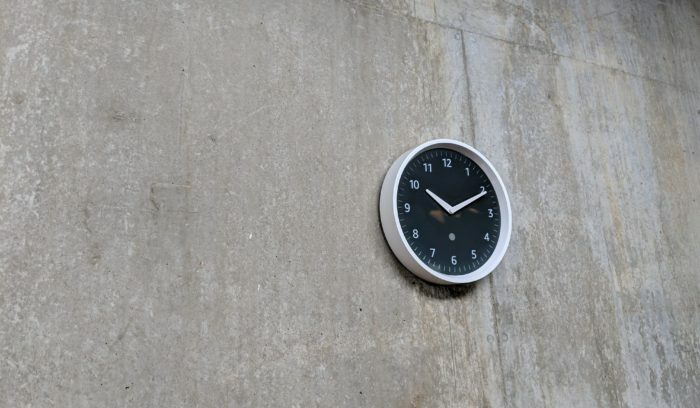 The Echo Wall Clock: Because I am crazy I love this $30 wall clock. The minute hands are LED lights that can indicate how long you have left on an Echo timer. It’s also notable because this, the Amazon Microwave and the Amazon Auto include a new Amazon developer board and kit that is game-changing for the smart home. We’ll talk more about that in tomorrow’s newsletter. I don’t know when this will be available. The Amazon Basics microwave includes Alexa and a Dash button that can order more popcorn. Also pictures is the new smart plug. Amazon Smart Plug: One of the most compelling onstage demos was built around this plug, although the plug is nothing special. The outlet is $25 and will be available in October. But the demo was of Amazon’s new easy setup program that combines Amazon’s Wi-Fi locker, which stores your Wi-Fi credentials, and Wi-Fi Simple Set Up. The result was that when you plug in the outlet Alexa discovered it automatically and then said it found Smart Plug 1. It then asked if you wanted to rename that device, which you could do from the voice interface. So seamless! Amazon will share this tech with partners starting with TP-Link and Eero, which means routers from those vendors that support this will let consumers experience that easy setup. 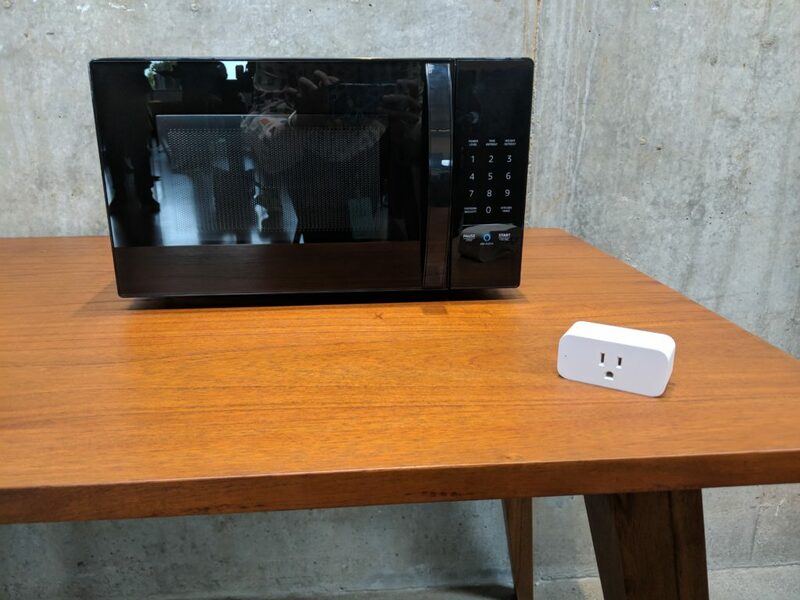 Amazon Basics Microwave: For $60 I think most dorms will soon have this 700-watt, .7 cubic foot microwave that connects to Alexa so you can tell it to reheat a pizza or coffee. As a fun bonus, it also has a button that will use Amazon’s Dash service to reorder popcorn. You can pre-order it today and it will arrive Nov. 14. Alexa, reheat my Thanksgiving leftovers! There’s also a new standalone Ring Stick Up camera for both inside and outside in a wired and wireless version. Amazon also showed off new features we’ll talk about tomorrow including Alexa Hunches, the aforementioned Amazon Smart Connect ecosystem and Alexa Guard, a smarter way to implement security.